Schlumberger Limited, the world’s largest oilfield services company and a leader in environmental services, is drilling for good students at Wright State. 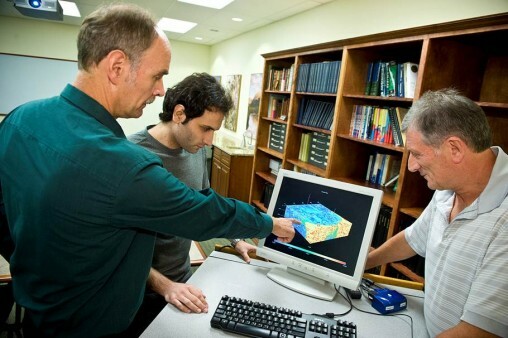 Schlumberger gave a $5 million geology software program to the College of Science and Mathematics’ Department of Earth & Environmental Sciences in 2011 and followed it up this year with another $5.8 million software gift. They were the single largest gifts in the history of the department. The first software gift transforms data into colorful, three-dimensional images of underground deposits, rock formations and reservoirs filled with oil and gas. The second gift helps users understand flow—the flow of oil and gas in reservoirs and the flow of groundwater in aquifers. Wright State is using the software to train students both in oil and gas exploration and the cleanup of contaminated brownfield sites. Schlumberger also supplied Wright State with a license that allows the software to run on the Ohio Supercomputer Center. The extreme computing power expands the scope of the software, resulting in increased resolution and greater detail. Soltanian is working with Naum Gershenzon, Ph.D., a research associate in Earth & Environmental Sciences. 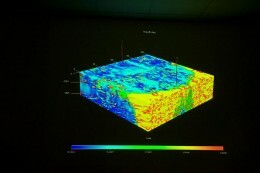 They are using the software to model complex flow patterns in order to enhance oil recovery. They are also using it to assess the viability of plans for the underground storage of industrially produced carbon dioxide in order to slow the accumulation of greenhouse gases and global warming. Wright State has a well-established program and a strong reputation for applied geophysics, hydrogeology and environmental science. Ritzi said Wright State has long been unique among schools in the Midwest because petroleum companies have sought out its students. « More from Environmental Sciences, Ph.D.